Spilberk Castle stands on the highest hill of the city of Brno. It is located in South Moravia and reminiscent of royalty to the royal palaces of the past. 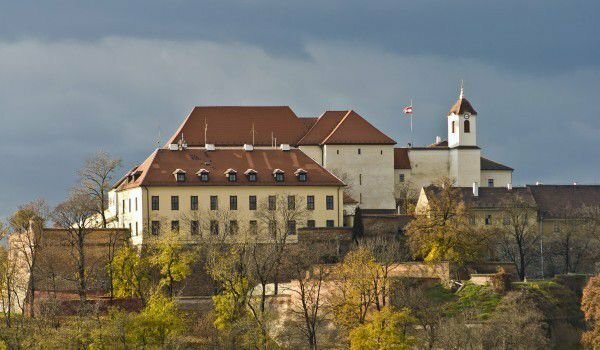 With its more than 700-year history, the Spilberk Castle was originally built as a medieval fortress of the kings in 13 century, but during the 17th century was converted into a magnificent baroque palace. Currently the castle is closed for public visits because of its basic restoration. Spilberk Castle is easily accessible and is located only 10 minutes walk from the main square of Brno - Namesti Svobody. Currently the Spilberk castle houses the historical museum, and while the palace is one of the most important cultural centers in Brno. In 1962 Spilberk Castle was declared a national monument. The castle was built around the mid-13th century of low (290 meters), but fairly steep hill that rises just above the historic city center (about 220 meters). Construction of Spilberk is an order of the Czech King Premysl Otakar II, who has wanted the extensive palace thought not only as a symbol and stops of royal power, but as a worthy seat of the rulers of the whole of Moravia. The earliest written evidence of the existence of the castle belongs to the period 1277-1279, when gradually added was the chapel of the castle. As a well-restored Baroque palace in the 17 century Spilberk begins to open its dark side. Since the castle was erected, it has a large and secure space that is the prison. Until 1945 in Spilberk Castle there was a prison and barracks, where horror and violent death by torture and terror were alive. In the prison of the castle were killed many French revolutionaries, Italian Carbonari, supporters of the Young Italy movement as well as Czech political prisoners. During World War II the undergrounds of Spilberk are a known place of torture and terror. From 1961 the Spilberk Castle is transformed into a museum which houses various exhibitions. The cells of the prison and barracks are also available for public visits. Brno City Museum, located in Spilberk each year is visited by 100, 000 visitors from home and around the world. During the summer months the Spilberk Castle turns into a lively and colorful place for various cultural events such as concerts, theatrical performances and historical reenactments. Even sports events are a manifestation beyond the fortress walls of the snow-white facade of the castle. From the bell tower of the castle, a small observatory site opens fabulous views over the city of Brno and its surroundings.